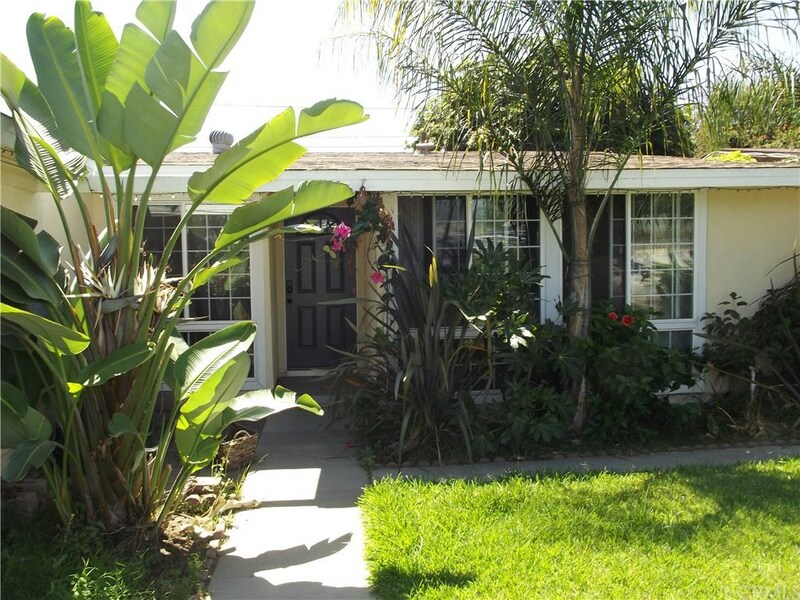 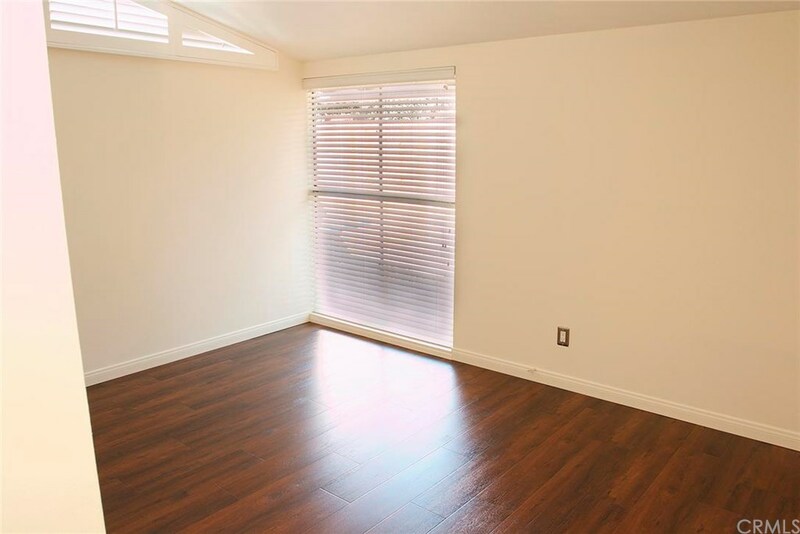 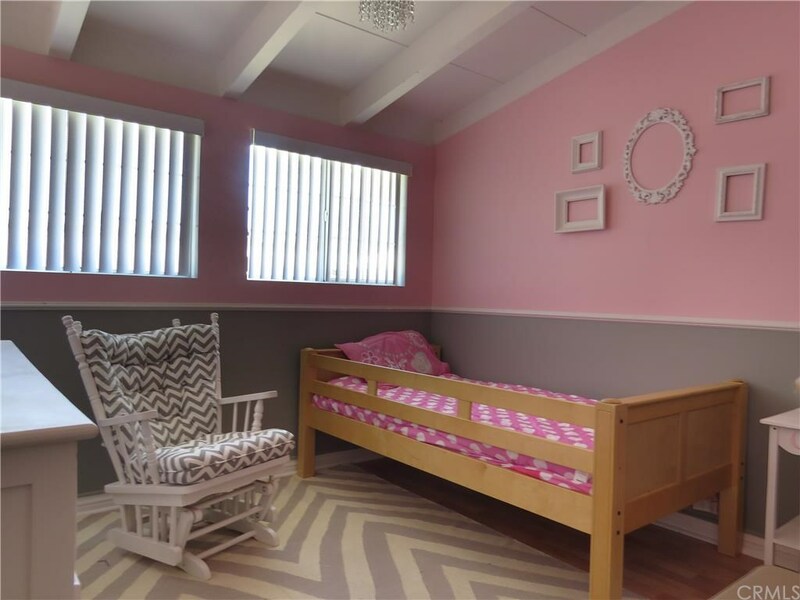 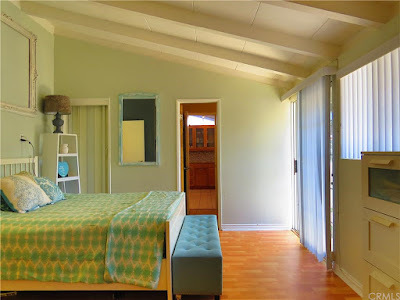 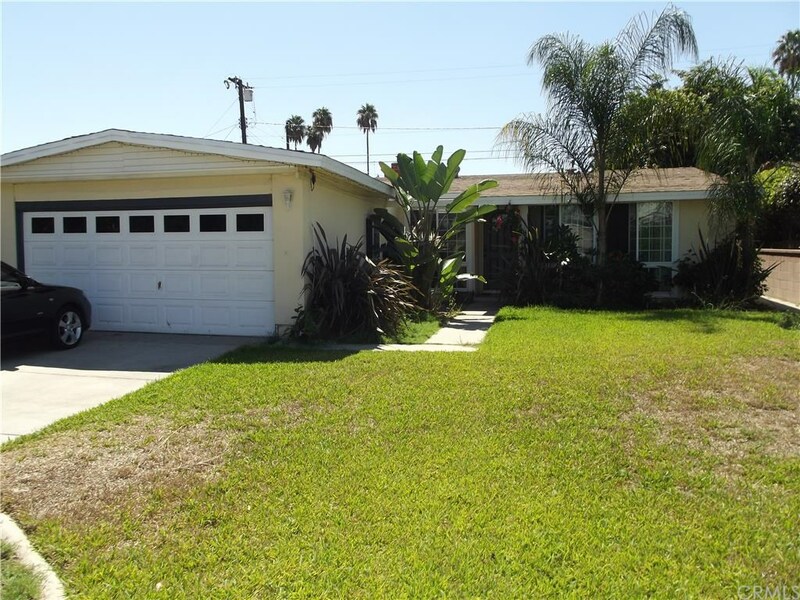 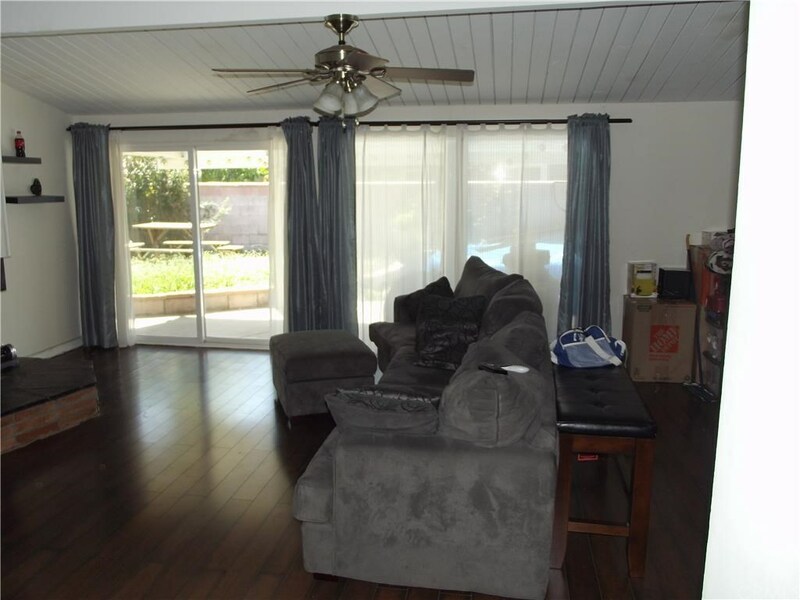 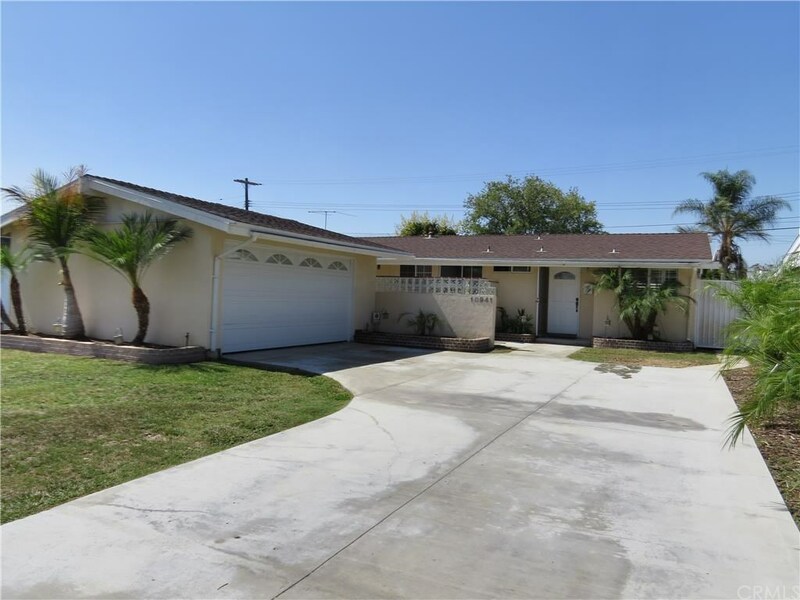 Situated in east Whittier, CA is this 1,334 square-foot 1955 Palmer & Krisel-designed home offers three bedrooms, two bathrooms with a fairly original layout on a nearly 6,500 square-foot lot. 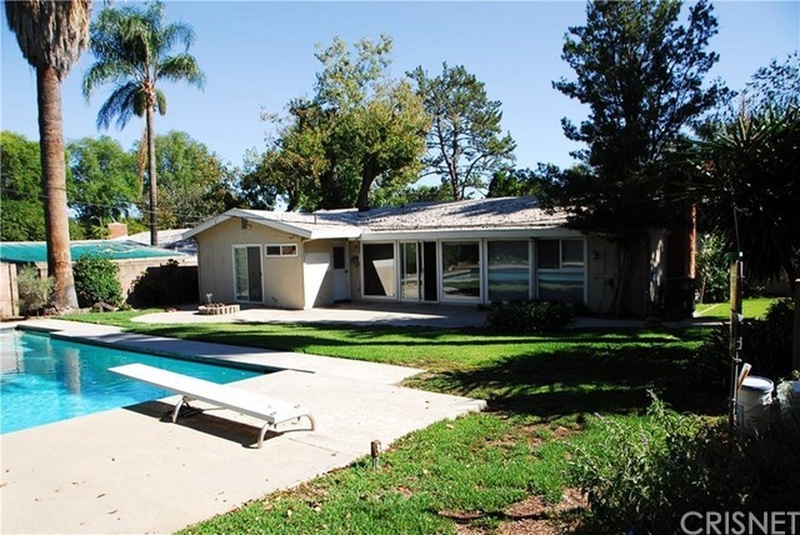 With a two-car garage and a large in-ground pool, the asking price on this home is $524,000. The front of the home still retains its distinctive Krisel lines, with some small modifications to the garage door and courtyard wall over the years. 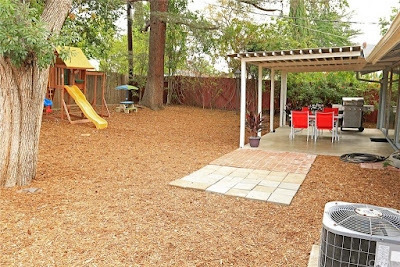 The yard is green and well-kept, fully devoid of any shade trees but does feature some minimal landscape at the base of the garage and home. A traditional Tuscan-style front door leads visitors into this home and leads visitors and guests into the kitchen. One of the few modifications made to the floor plan of this home was the removal of the demising wall between the entry and kitchen. 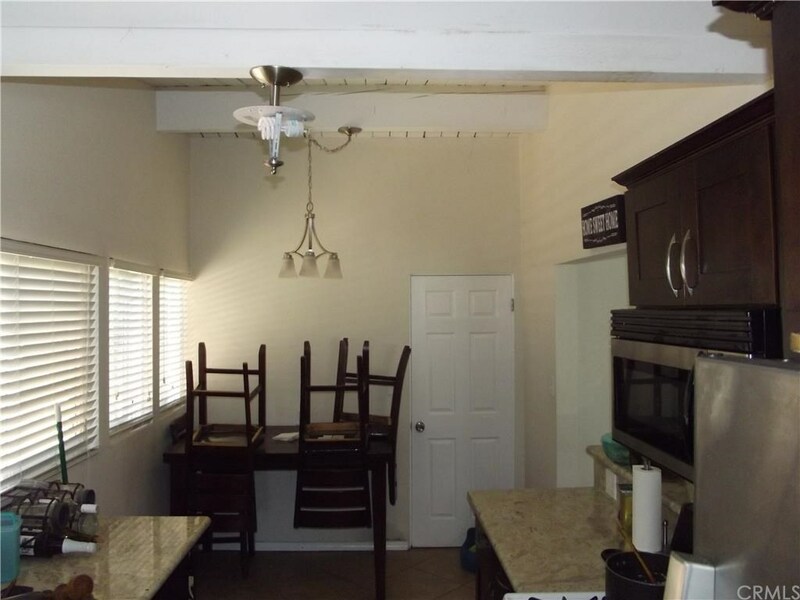 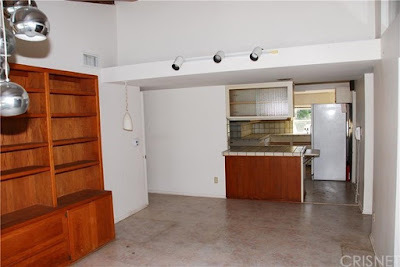 The original breakfast nook which would have sat at the front of the home has been annexed by the kitchen, and allows for a larger dining area at the rear of the home. 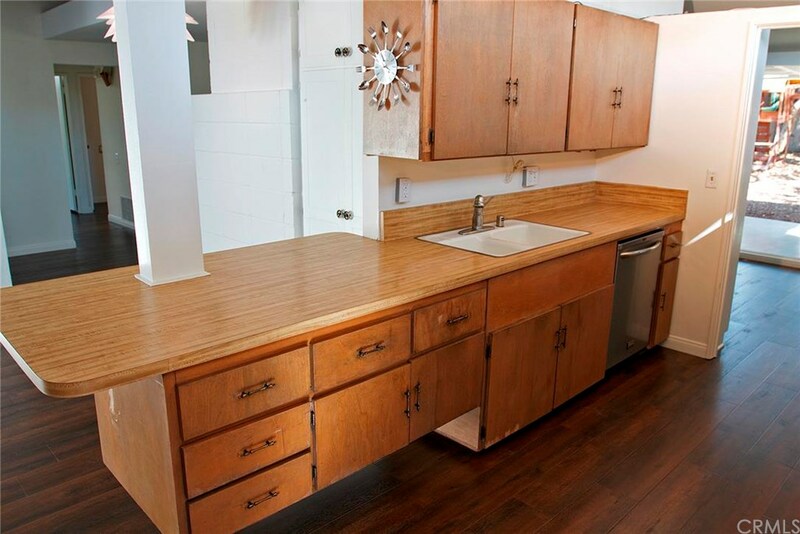 The kitchen has been updated with relatively clean-lined shaker style cabinets that have a modern look to them. 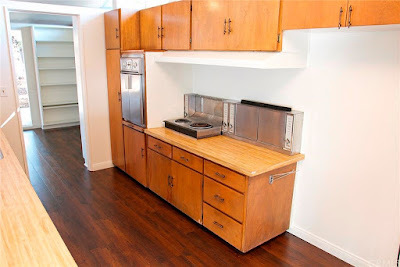 The rest of the kitchen features the original clerestory windows, mosaic backsplashes, the requisite granite countertops and stainless steel appliances. 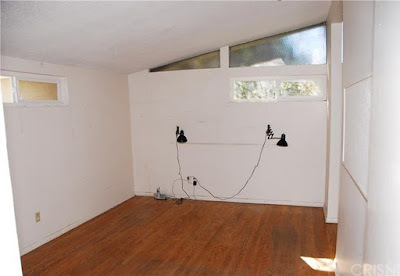 The open beamed celotex ceiling is still in place throughout the home, along with the original lighting soffit in the living room. 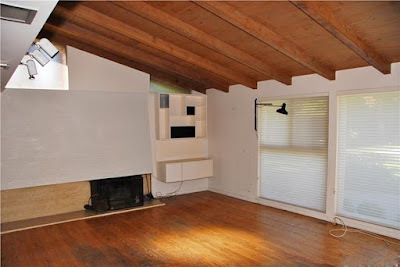 The living room is anchored by the original stacked stone fireplace, which has been painted white at some point over its lifespan. All of the windows in the home have been retrofitted with white vinyl mullioned replacements, while the original sliding glass doors have been replaced with mullioned French doors. 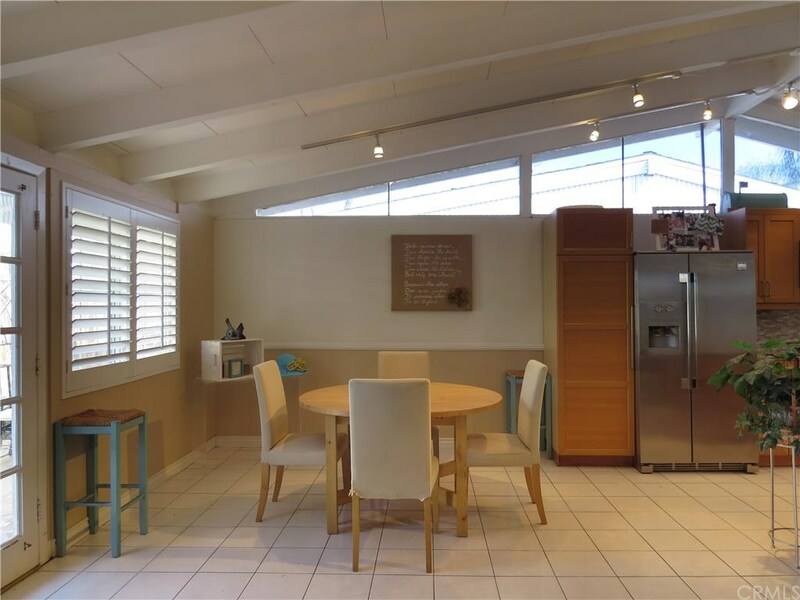 The mullions unfortunately create division where the lines between the indoors and out were meant to blur, which ironically is in contradiction with the kitchen wall removal. 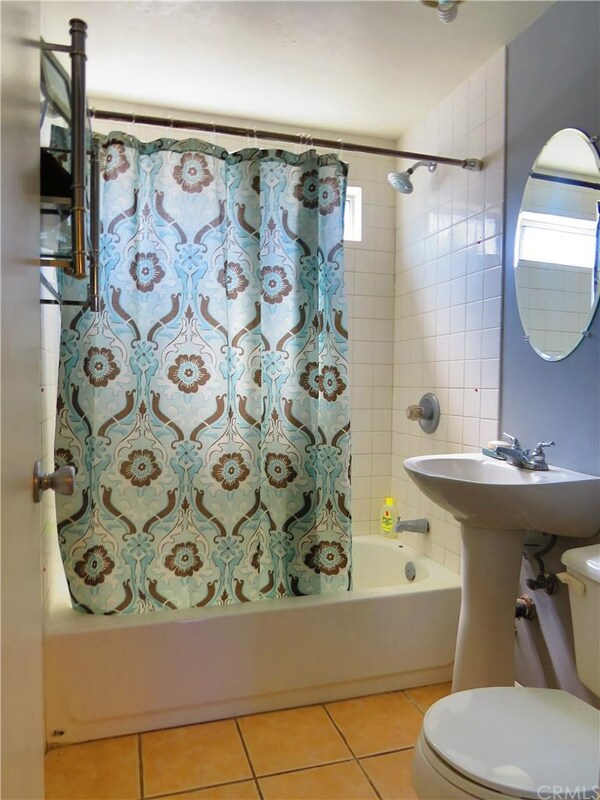 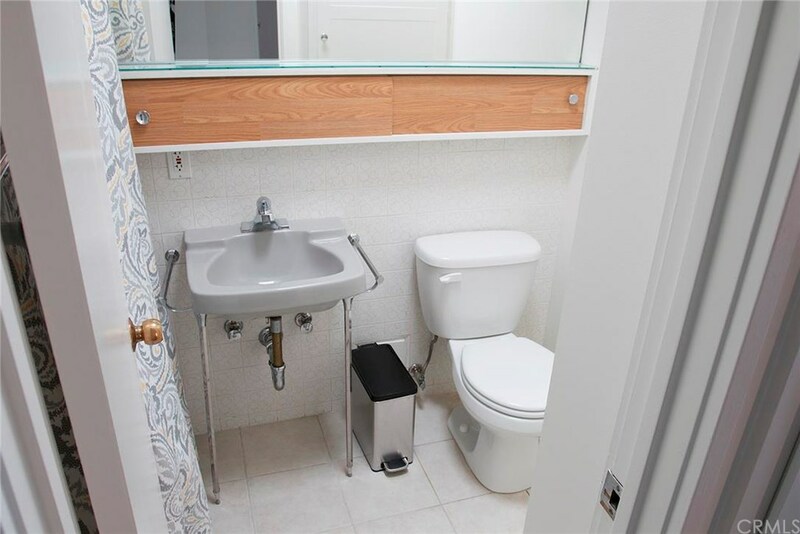 The bathrooms have all be updated in a fairly traditional manner and do not necessarily reflect the midcentury modern character of the home. 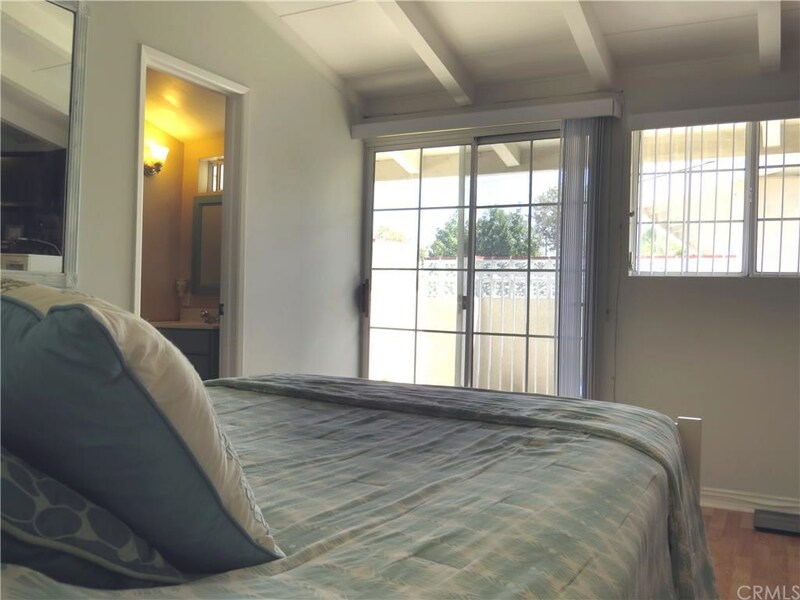 The bedrooms all remain in their original configurations, and the master bedroom provides a mullioned sliding glass door out to the front courtyard. 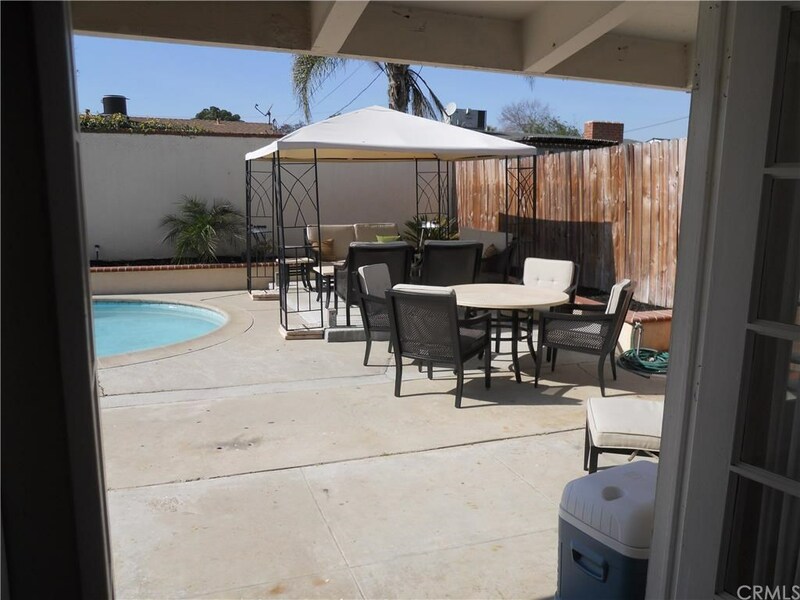 The backyard is contains a large in-ground swimming pool and patio, some portable cabanas and a small planter at the back of the yard. 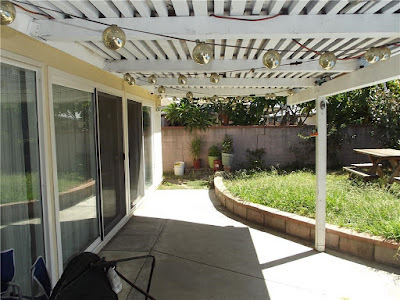 Otherwise, the yard is devoid of shade or vegetation to soften harsh edges. 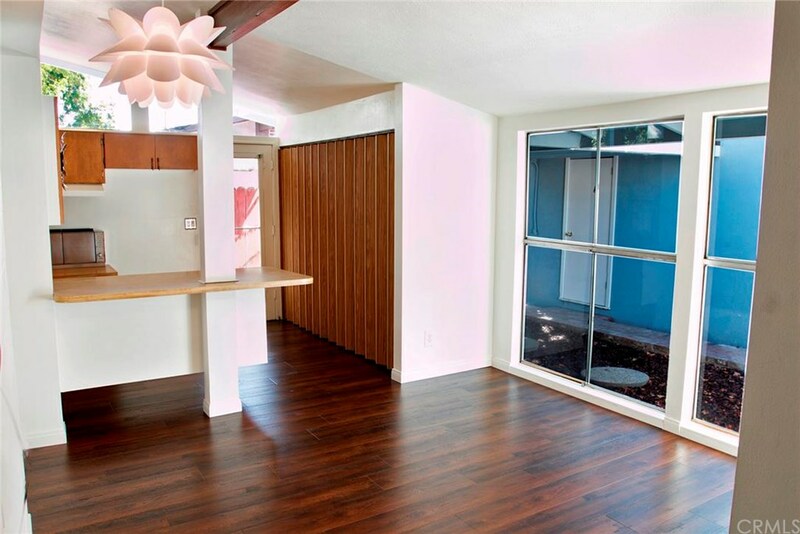 Overall this Palmer & Krisel midcentury home is move-in ready and ready for the modern to be put back into it. 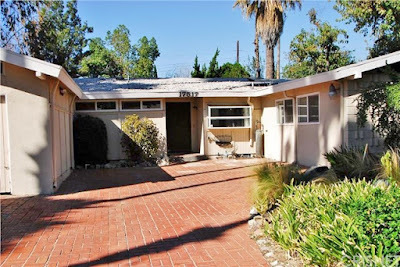 With fantastic original exterior lines, this 1956 three bedroom, two bathroom Palmer & Krisel-designed home in Northridge, CA in the San Fernando Valley is priced to move. Situated on a nearly 7,500 square-foot lot, this 1,392 square-foot modernist residence includes a two car garage with an asking price of only $499,000. 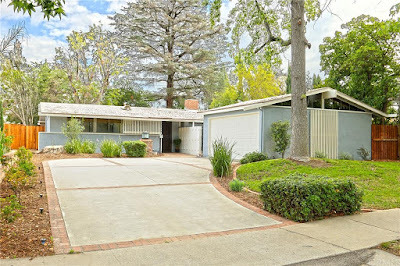 The exterior features all those great tell-tale Palmer & Krisel-lines, with clerestory windows on the sides of the home and two-car garage, vertical wooden banding on the garage and over the front bathroom window screening it from street view, and a decorative concrete block wall adjacent to the front door. The roof is vintage white rock which completely fits the style of the home, and the post and beam architecture is visually present through the use of exaggerated beams at the sides of the home. 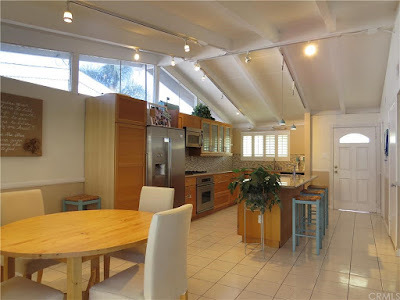 The home features the living and dining rooms at the rear of the home, a small family room at the front, and a galley kitchen along the east side of the home. The living room is anchored by the distinctive large modernist Krisel fireplace that was unique to the Northridge West subdivision with open corner and wrap around block surround. 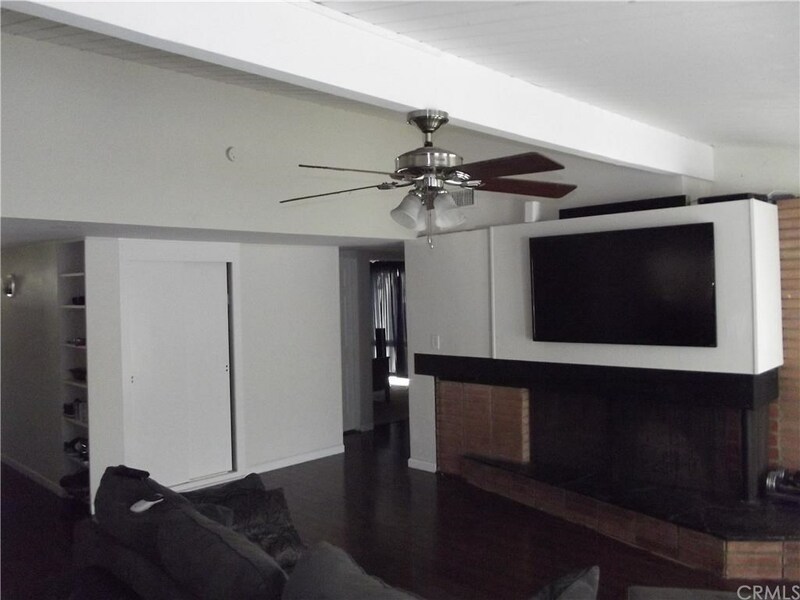 The fireplace acts as the divider between the living and family rooms, while an overhead soffit helps define and divide space. 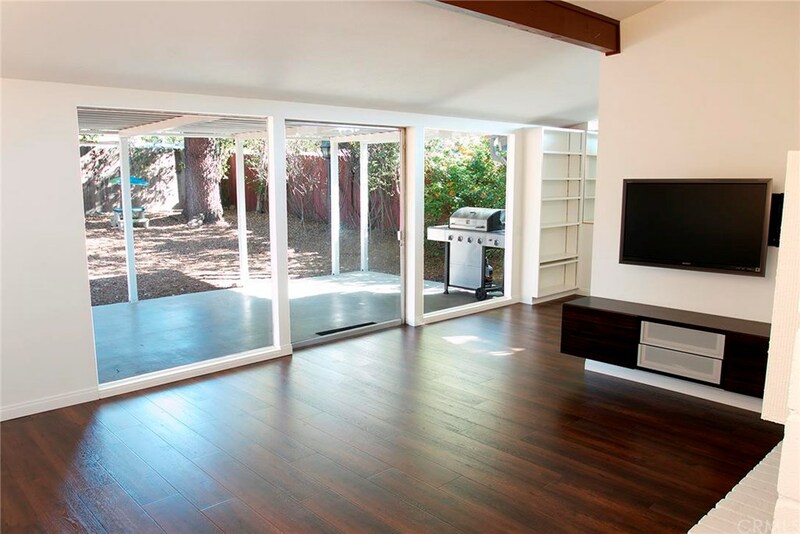 The living room features signature Krisel walls of glass overlooking the backyard, while the family room features the original four-pane floor-to-ceiling windows overlooking the courtyard between the garage and front of home. The kitchen is wonderfully original, with butcher-block laminate countertops and a dishwasher being one of the few updates. 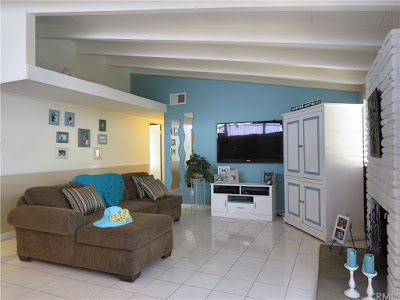 The signature Krisel floating island between the family room and kitchen is still in place, white the original oven and futuristic drop-down cooktops steal the show. It’s pretty rare to see an original drop-down range still in place, and we hope it stays with the home. 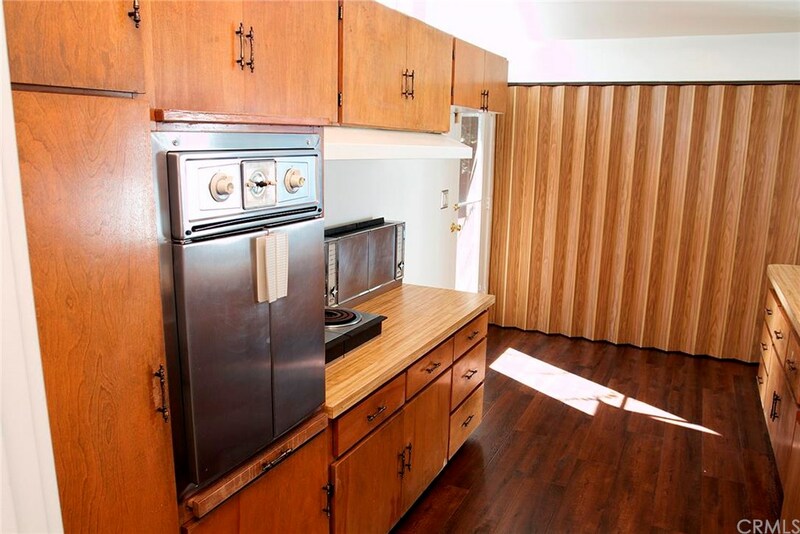 Hidden behind the original wooden accordion doors is the laundry room, which also sits next to the family room. 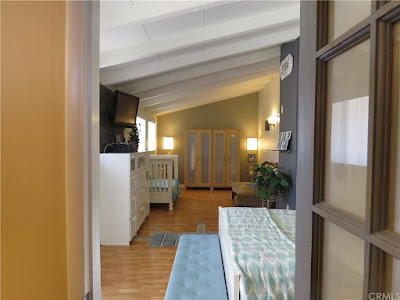 All three bedrooms incorporate their original four-pane windows, while the bedrooms on the west end of the home still feature their original clerestories. 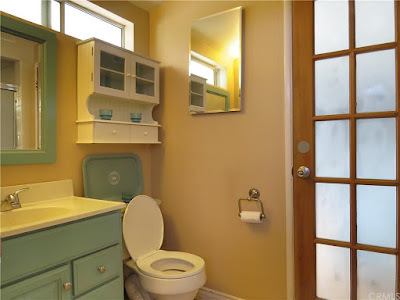 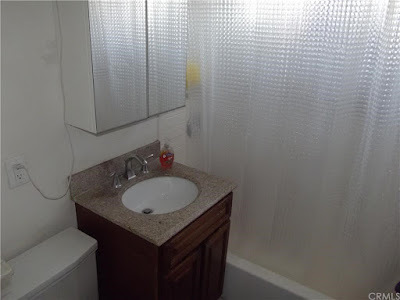 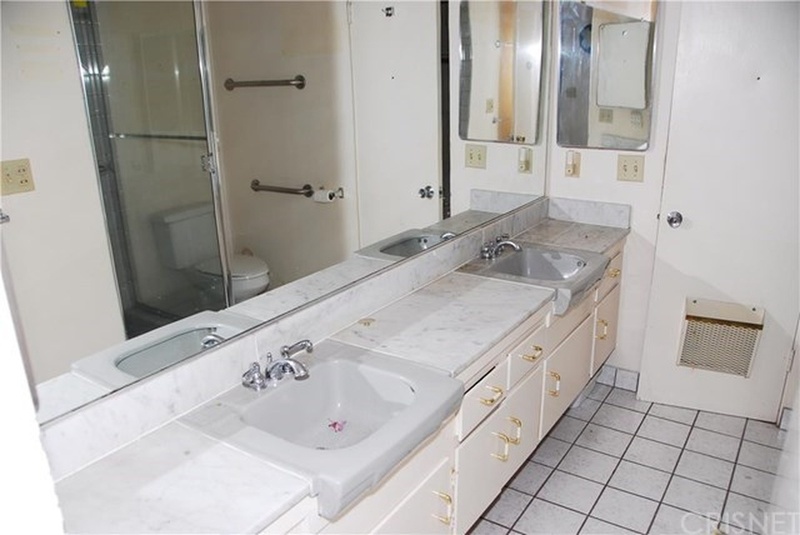 The bathrooms have been updated in some places but still feature some great original flare, including original cabinetry and sink in the master, along with vintage retro-esque medicine cabinets. 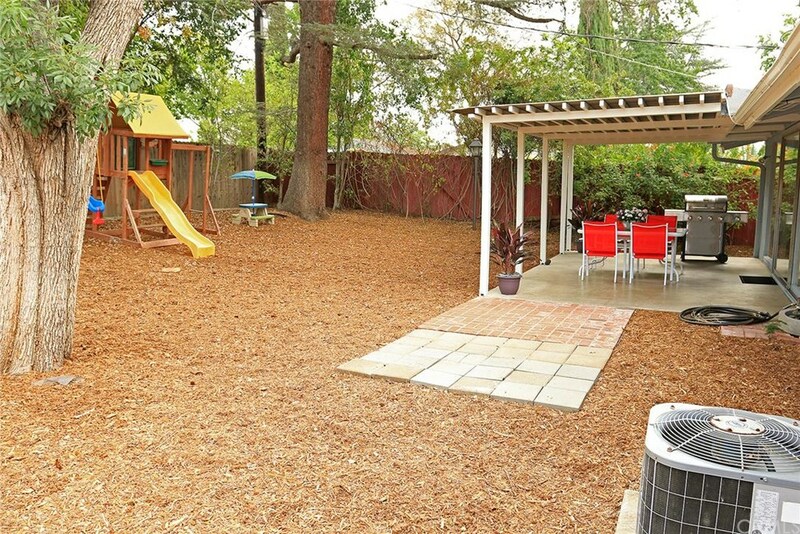 The backyard includes a covered patio, several mature trees and a heavily mulched ground plane. We love seeing Palmer & Krisel homes that are chocked full of original goodies, and this one’s got plenty of great detail with loads of great original character that hasn’t been ruined. 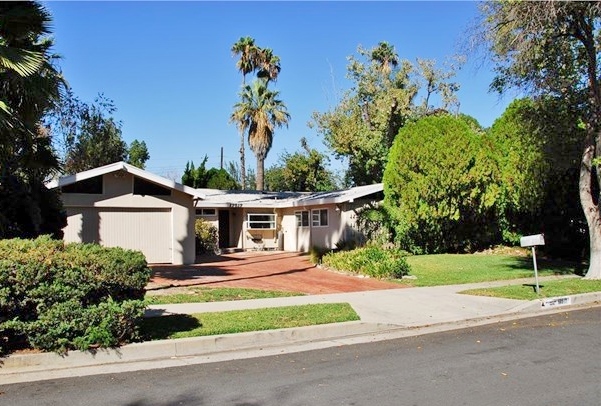 Predicted by Redfin to be a quick seller, the current asking price is too good to pass up for those looking for that perfect midcentury modern home in the San Fernando Valley. 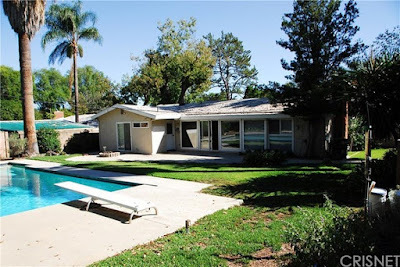 Northridge College Estates is one of our favorite Palmer & Krisel subdivisions in the San Fernando Valley. It’s got moderate sized homes with a variety of rooflines set on large, deep lots. Todays featured Palmer & Krisel-designed home was built in 1959, features four bedrooms and two bathrooms in 2,395 square feet, a large in-ground pool, and a two-car garage all on a large 11,300 square-foot lot. With both original elements and updates from the later 1970s, which are now vintage in their own right, this home is loaded with well-worn treasures. 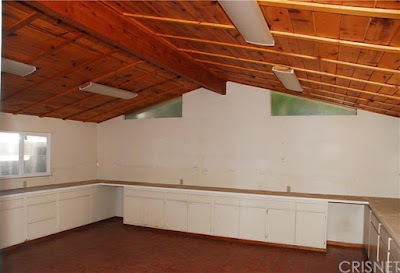 The original two-car garage has been converted to a workshop, and a second garage that is nearly identical in architectural style to main home has been added to the front of the property. 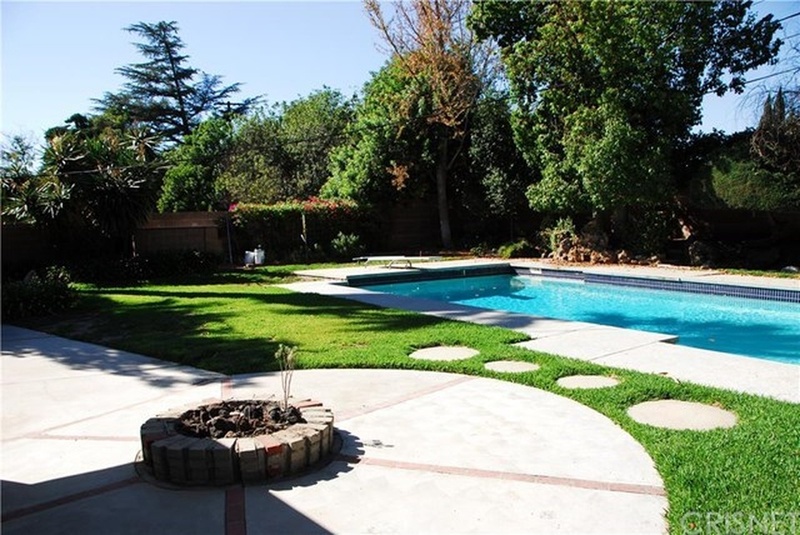 The front of the home contains mature plantings, a full lawn and a large sweeping red-brick driveway. Hidden behind those dense front yard plantings along the south wall of the former garage is a full wall of Krisel’s signature shadow H-block, waiting for the new owner to expose it. The living and dining areas sit at the rear of the home overlooking the large backyard and swimming pool through Krisel’s signature walls of glass. 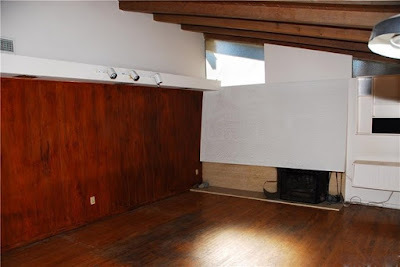 The living room is anchored by one of Krisel’s hallmark modernist fireplaces, surrounded by clerestories and built-ins. There’s great wood paneling below the original soffit which joins the living and dining rooms, highlighted with some great 70’s track lighting. 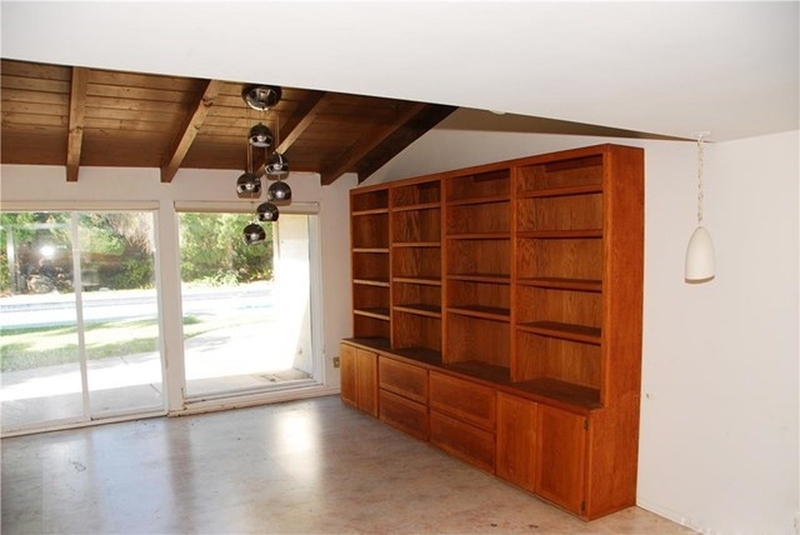 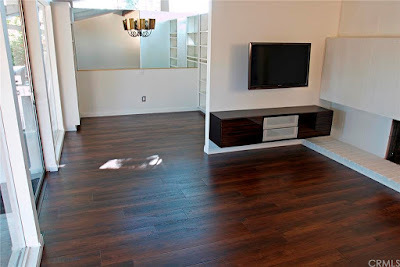 The ceilings are the original open-beamed wood, while the floors are vintage hardwood that need some attention. 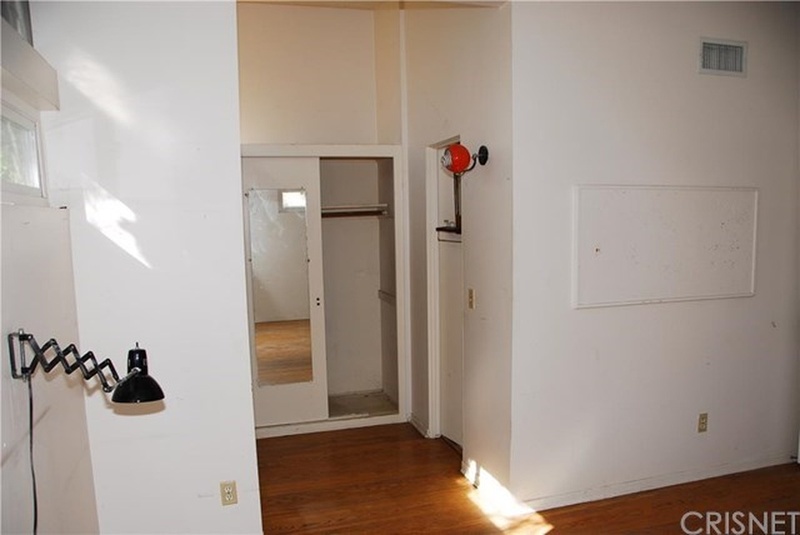 In the dining room hangs a really intriguing 1970’s chrome chandelier that isn’t necessarily original, but one of the coolest fixtures we’ve seen in a while. 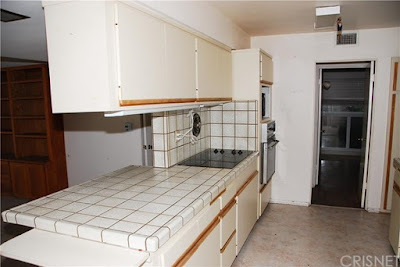 The kitchen looks into the dining room, and looks to have been updated in the early 1980’s or late 1970s. 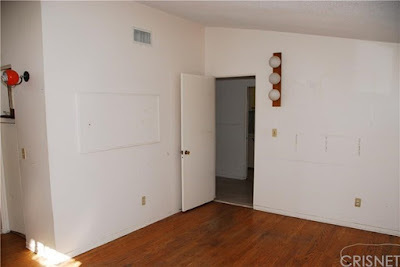 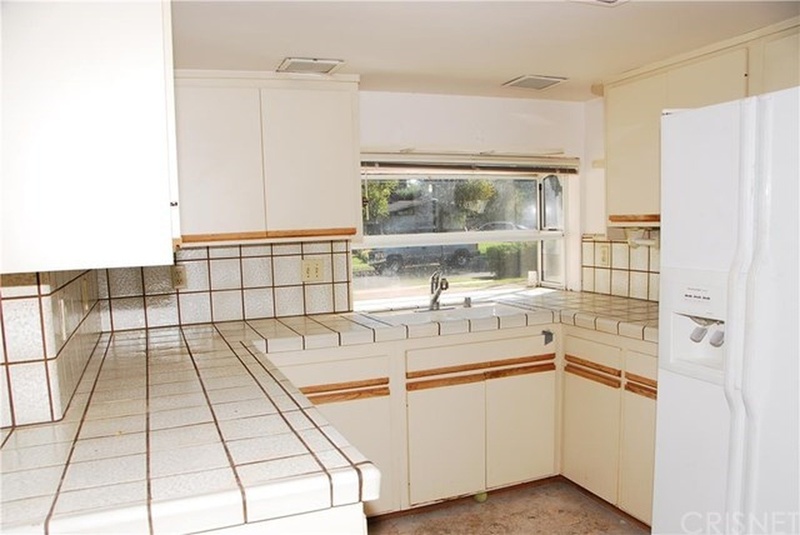 The layout of the appliances and cabinetry are as they were with the original kitchen, and interestingly enough the original kitchen wall exhaust fan is still in place. The cabinets are laminate while the counters are tiled, and there’s a fantastic reeded-glass paneled display cabinet looking into the dining room. 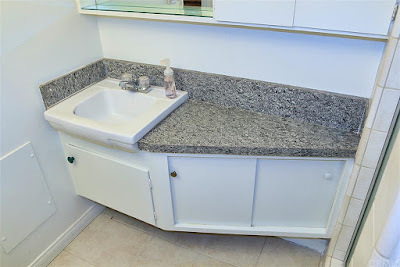 The original double-sinked marble vanity and cabinets are still in place in the hall bathroom, a popular Krisel design that should to stay with the home. 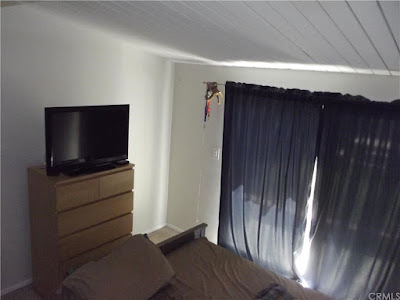 The bedrooms all still feature their original clerestory windows, which help enlarge small spaces, and also have some more great vintage 1970’s light fixtures. As mentioned above, the former garage has been converted to a workshop with lots of built-in shelving, adding about 400 square feet onto the home. The backyard is well-maintained with a large, newer appearing in-ground pool, lots of turf and mature plantings along the perimeter of the yard. 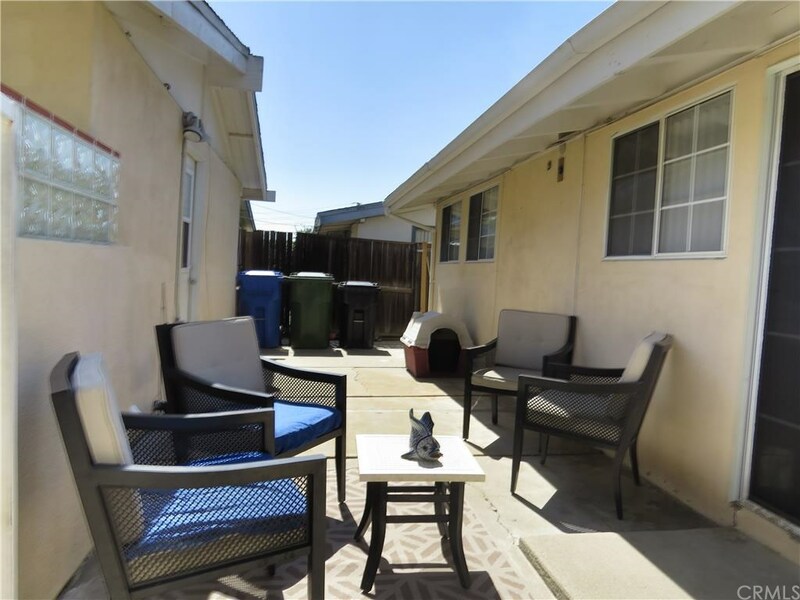 A large concrete patio wraps around the back of the home, and a firepit adds to outdoor entertainment options. 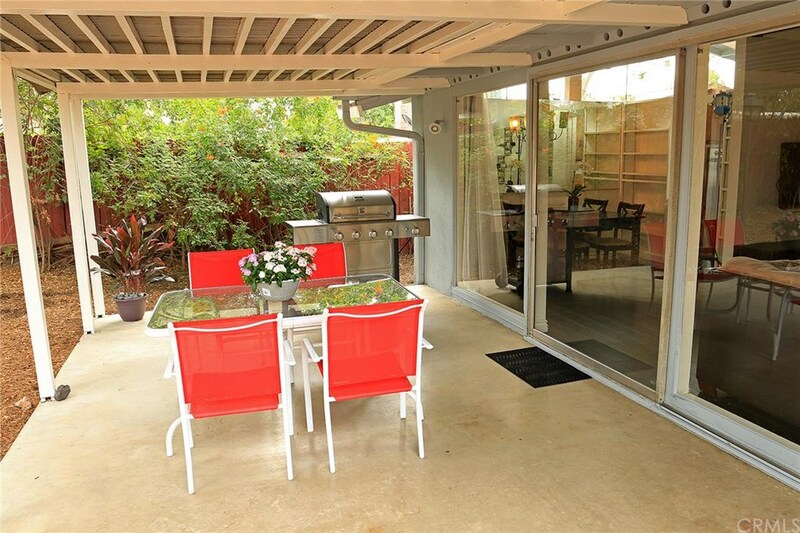 This Northridge midcentury home has great potential to really shine, and the well-kept vintage elements make this property a great find for one lucky buyer. Built in 1955 in southwest Whittier is this four bedroom, two bathroom 1,340 square-foot Palmer & Krisel-designed home. Featuring a two-car garage on an efficient 5,000 square-foot lot the home carries a low asking price of only $379,900. The front of the home holds a green grassy lawn, with dense plantings at the base of the home. 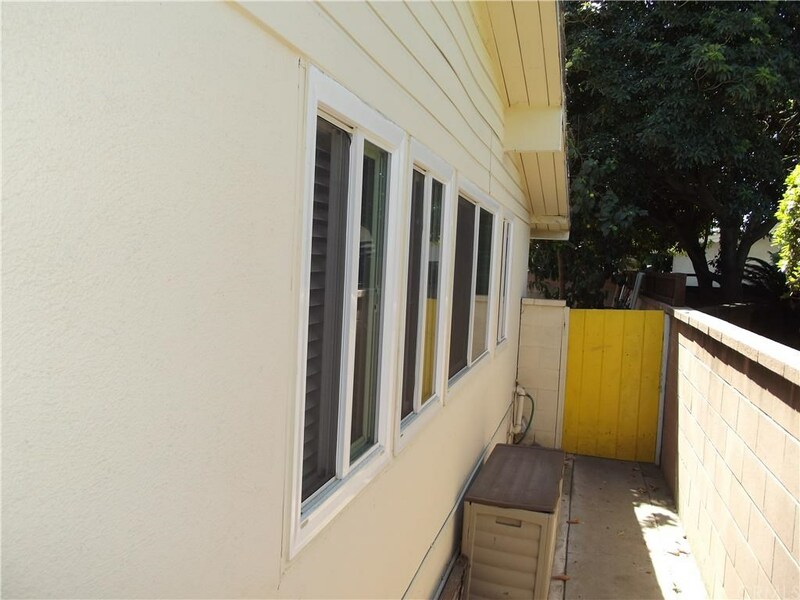 The large four-pane front windows have been given up in favor of while vinyl mullioned replacements, with thick white molding, which alters the intended modern appearance of the home. 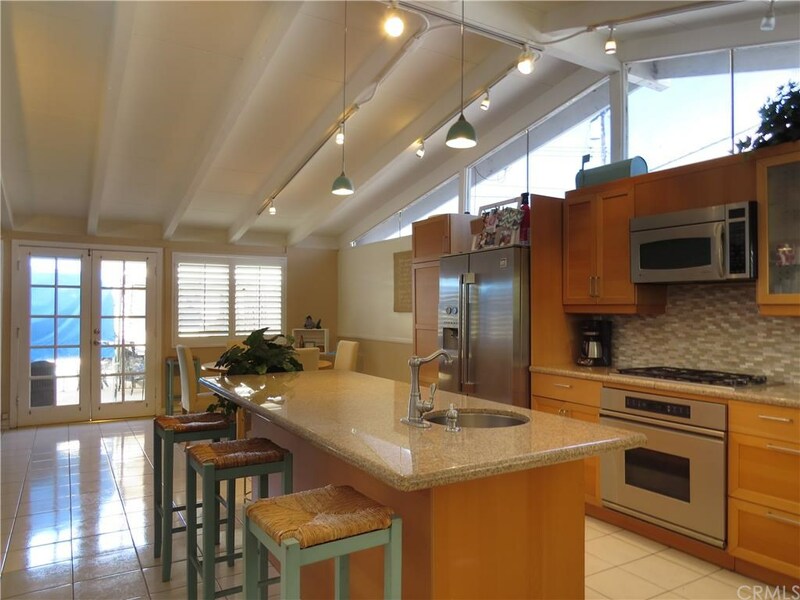 Like most Palmer & Krisel-designed homes, the kitchen, living and dining rooms are all at the rear of the home overlooking the backyard. 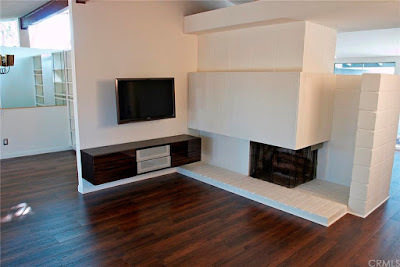 The living room is anchored by a modernist corner fireplace with a stacked brick surround. The angled hearth appears to be a later addition, yet still vintage. The open beamed ceilings are still in place, while the common areas are floored in dark wood laminate. 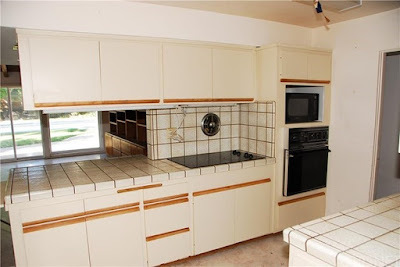 The kitchen has been updated with typical big-box store style materials – dark cherry cabinets, granite counter tops and stainless steel appliances. 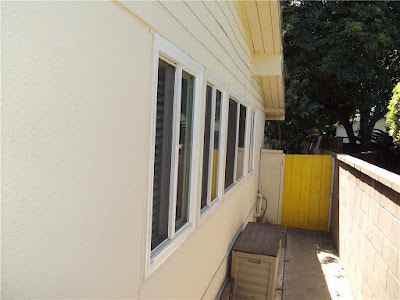 The clerestories on the sides of the home have long been covered over, replaced with warping plastic siding on the outside and drywall on the inside. 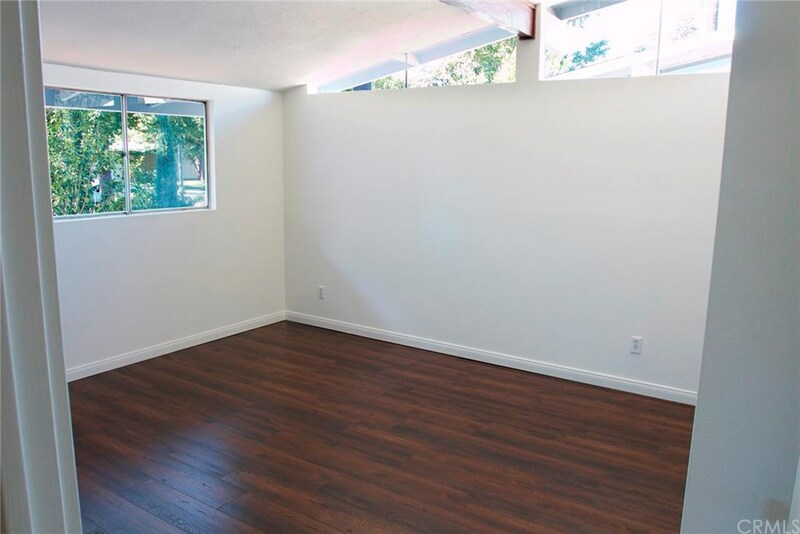 This cuts down significantly on the amount of natural light entering the living areas and bedrooms. 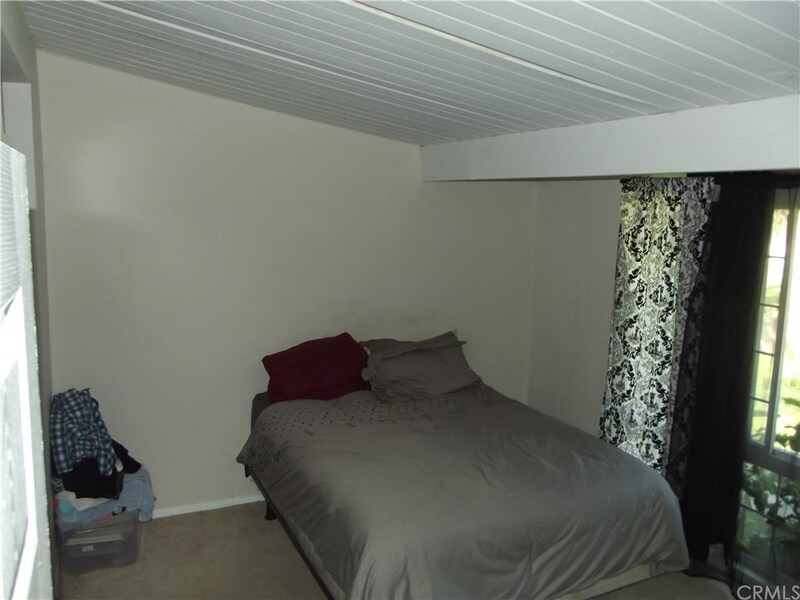 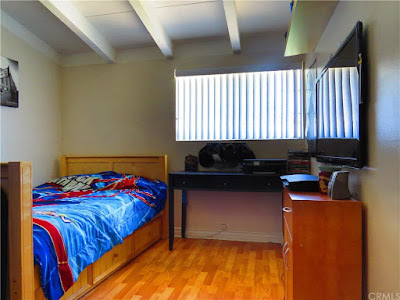 The bedrooms are all fairly modest in size, as four bedrooms in 1,300 square feet is a tight fit in any situation. The bathrooms have all been updated over time with simple, generic materials that don’t reflect the midcentury modern style of the home. 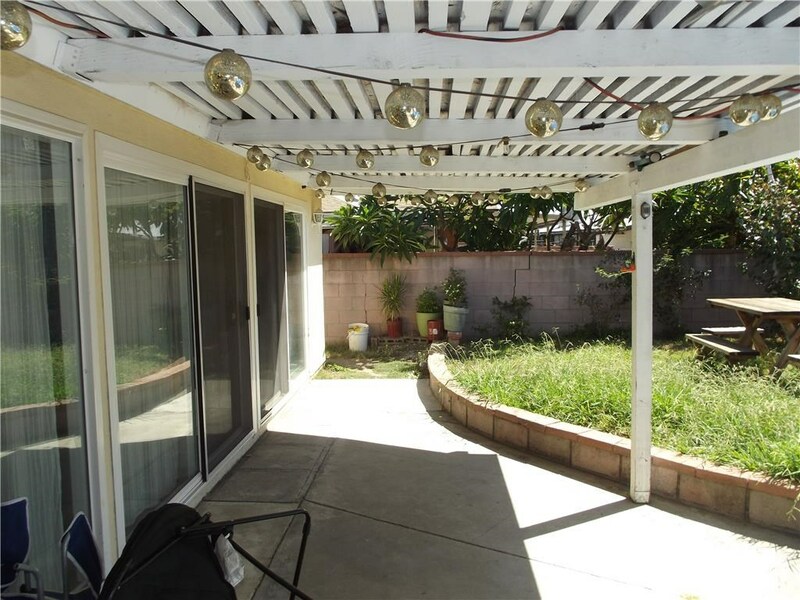 The backyard contains a trellised, covered patio and raised grassy area. There’s definitely some TLC needed on this property, and restoration of the original clerestories would help make some of the small spaces feel larger. At its current price, this home definitely won’t last long, hopefully the new owner will see the modernist potential that this property holds.